bust darts – up or down? How do you prefer to press side bust darts – do you press them upwards, or do you press them down? I was taught to press them upwards, the theory being they were less noticeable from the outside. 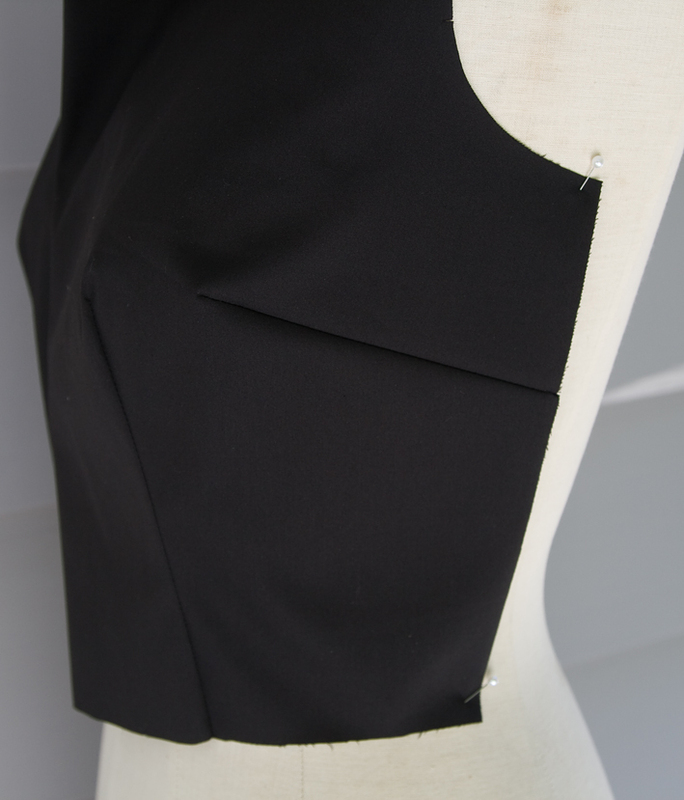 I don’t usually sew commercial patterns, but I notice the vintage ones I’ve sewn recently all indicate to press the darts down in their instructions, and I can’t think of any reason for doing it this way – any suggestions? I’ve taken a couple of photos of my current project with one pressed up and one pressed down. Which one looks better – left or right? I prefer the one on the left which is slightly less obvious – in comparison, the one on the right looks like it needs a better press! Now guess which one is which….. The one on the left is pressed upwards, and the one on the right is pressed downwards. From eye level you look into the ‘ditch’ of the dart pressed down, whereas the ‘ditch’ is partially obscured by fabric when it is pressed up and so is less noticeable. 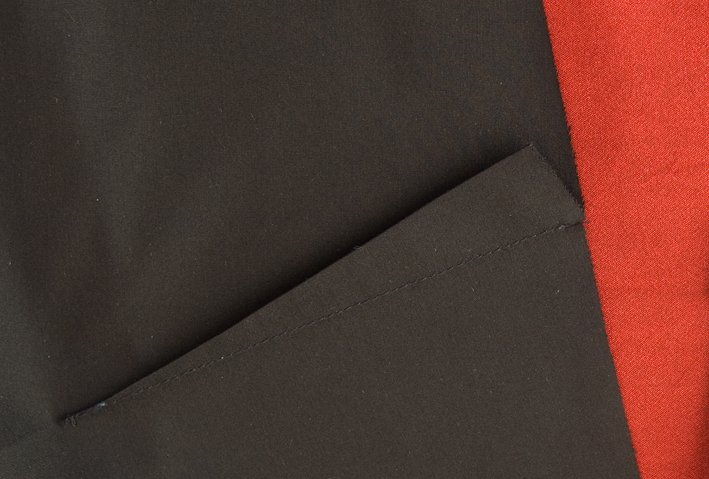 I admit the difference isn’t exactly major in this thin cotton poplin, photographed in low contrast lighting, and from a near horizontal viewpoint. If the fabric was thicker, in contrasting lighting, and viewed from eye level the difference would be even more noticeable! So my ‘experiment’ proves my theory, and I will stick to pressing my bust darts upwards for aesthetic reasons! So now you know my angle on this! Which way do you prefer – up or down? And more importantly – why? I have always pressed it downwards, now i shall try pressing it upwards…thanks for enlightening me on this topic! I, too, will try pressing up. Every pattern I've ever made has said to press bust darts down, or cut open and press flat. what a great post, I have always pressed down. I am certainly going to try this. the pressed up dart does look better. Very interesting post. I think your upward pressed dart is a major improvement from the typical downward pressed dart. What timing. I just read about this topic in the Singer book “Perfect Fit”. I always pressed darts down because that was how I was taught and I never questioned it. In the SInger book, they suggest that the dart pressed upward gives the impression of a higher, more youthful bustline. Guess who is switching her habit:) Mine are going up from now on! Actually, I guess it is good to look and see what you prefer, as you have done. I have always pressed mine down too! Thanks for showing us the difference. I think the pressed-down approach is so it doesn't get caught on your undergarments? Pressed up, the dart fold might get stuck on your bra.. maybe? Either way, it's good to think about *why* we do things and know that there might be a better way! Thanks Sherry, I always press mine downwards too – I'm definitely going to change that behaviour asap. Thanks again. Count me in the crowd that always pressed down, because that's what the pattern tells me to do. I'll definitely give up a try. Thanks for raising this topic! As a beginner I often question myself every step and wonder what would happen if I did it differently. It´s great to read your clever thoughts on this things. I've always pressed down, but only because the pattern sheets told me to. I just checked my new construction book and it says to press down, but doesn't give a reason why. I've always pressed upwards because I thought that looked better, but until you pointed out the fact that you're looking into the ditch I'd never analysed why it looked better. I've never paid much attention to instructions anyway! Thanks for (yet again) making me think about WHY I do something a certain way. I always like to know the “why”. I've always pressed down, but have no rational reason for doing this. I always pressed up, because somewhere or the other I read it looked more “youthful,” which I thought dubious but amusing. I've always pressed them down because that's how I was taught and that's how pattern instructions tell you to do it. But I might experiment with going upwards for a change ….! i always thought downwards was better (maybe I just thought about gravity…) but now I see upwards is better. you just made me a convert! I read in some book, that the direction depends on the fullness of the bust. I think it was press up if you're full, press down if you're not, so it adds a smidge of fullness. But I could be wrong, LOL. That's interesting. All the patterns I 've ever used have stipulated pressing down. I've got no idea why this is the norm. Hi Sherry, I just found your blog, it's great! I've always struggled with getting clothes to fit me properly, whether I buy then or make them myself so I'll be watching your tricks of the trade with interest. Taught to always press down because it then sits under the bust – that's the theory. i do try not to use the word 'always' as there are exceptions to every rule! 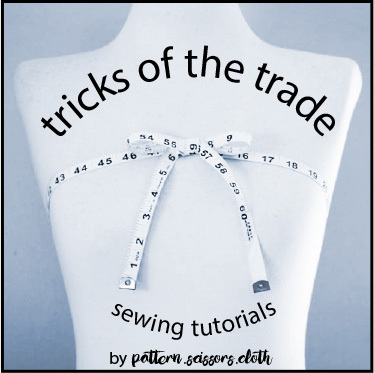 Wonderful post and with the addition of the comments above, this is pretty high up in my list of the most interesting/useful sewing blog posts ever. Any thoughts on in which direction to press contour darts? My Bible (Reader's Digest Complete Guide to Sewing) says inwards, my sewing tutor says outwards. I think inwards creates the illusion of a slimmer waist, which presumable most of us would favour. What does the trade think? Hi Marianna, I press contour darts and other vertical darts inwards, however I have come across a colleague who pressed them outwards. 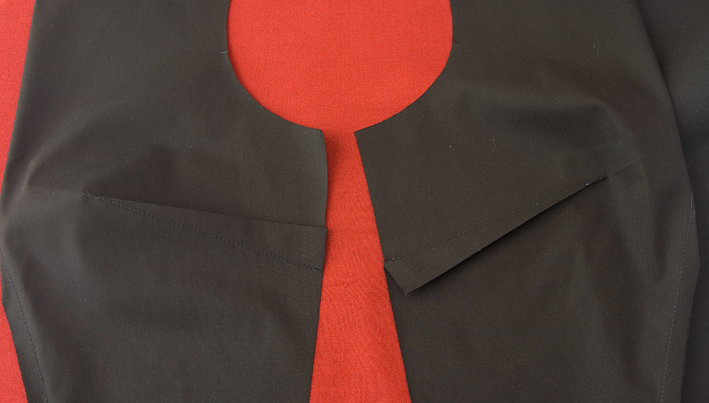 My theory for pressing inwards is the same – the 'ditch' is less visible from the front/back view. 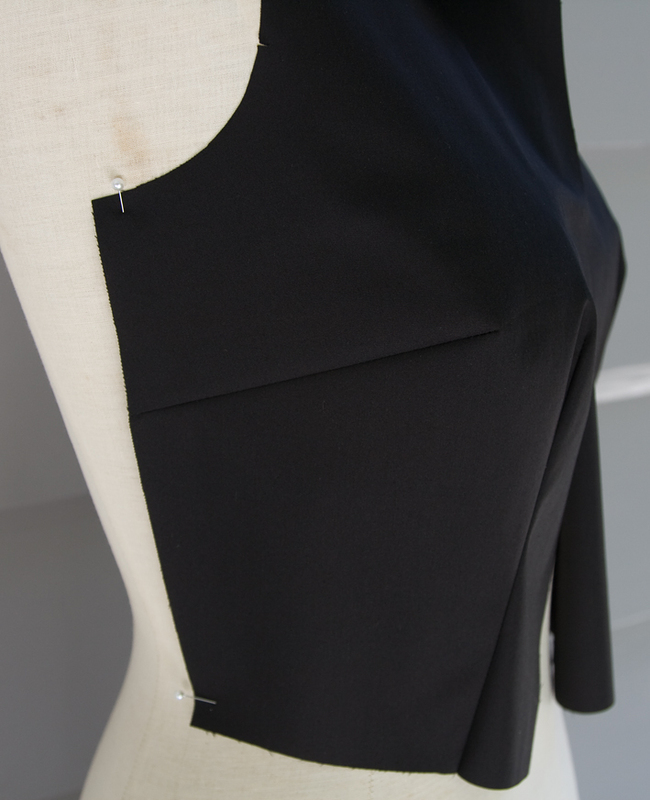 I am very late to this post because I am searching for the “correct” direction to press darts as I will be teaching a pattern making class in the Fall. Basically horizontal bust darts are normally pressed UP in production because the “roof” of the dart is more shallow than if it is pressed DOWN-meaning, in theory, better fabric consumption. I also agree that when they are pressed up they are a little less visible. Home sewing patterns are made to be pressed down. As for vertical darts, I've always pressed them toward CF but have been reading lately that pressing them toward the side seams creates a smoother line by putting the bulk at the side of the body instead of at the front. Perhaps the fabric consumption idea is at work here too. My first encounter with this was from Palmer/Pletsch. I can't remember if it was Patty Palmer or Marta Alto who said/wrote it however.